Tonight is the first opportunity I’ve had to use my embroidered evening bag, we’re going to a Halloween Ball, luckily it’s not fancy dress as I don’t do fancy dress, but I do like a black tie do! I made this bag earlier in the year, the pattern was from an old issue of Inspirations, an Australian embroidery magazine (why are the Australian craft magazines in a league of their own??) When the WI had a local competition for a bag, I knew just which one I wanted to do. The pattern called for linen, I wanted to use silk dupion so I used iron on interfacing to strengthen the fabric behind the embroidery. The basic outlines of the pattern were traced onto the back and then tacked in white thread so the pattern could be seen from the right side. 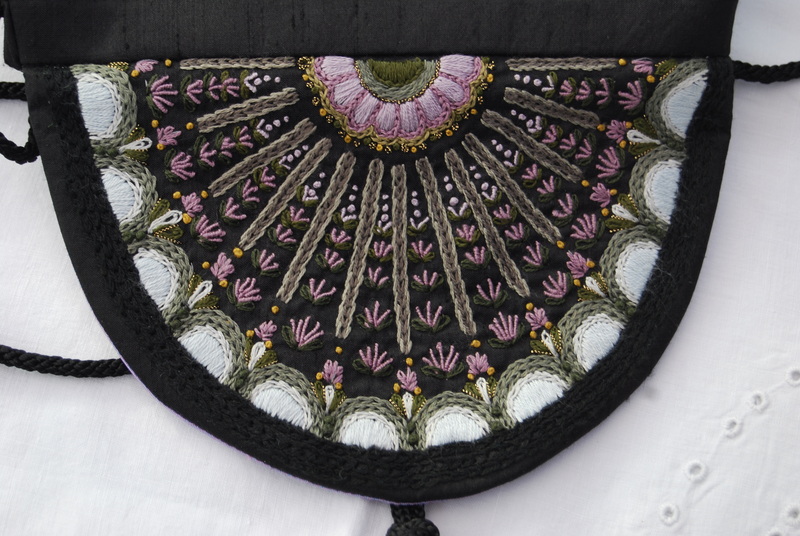 The embroidery consisted of chain stitch, stem stitch, bullion bars, satin stitch and french knots, so there was nothing too complicated but I think the effect is really pretty. 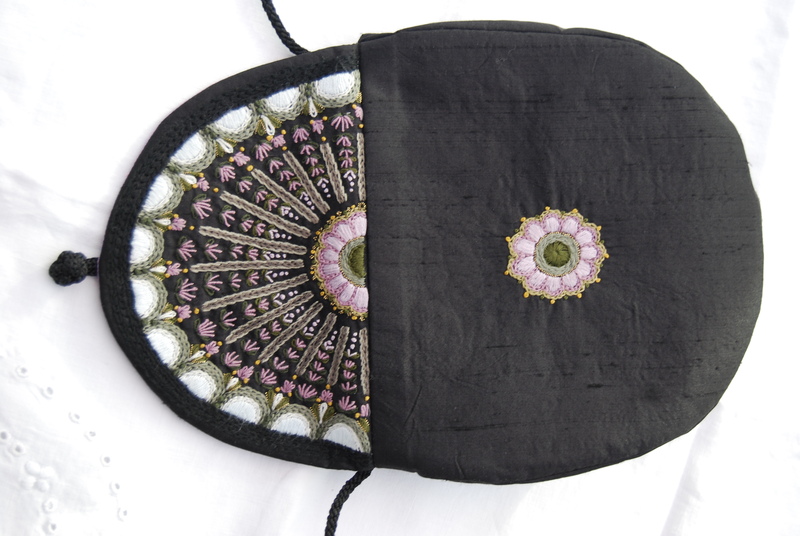 I lined the bag in a lavender silk dupion, used a frog and tassel closure, black cord was used for the strap. I wanted to slightly change the design of the bag as I wasn’t keen on the elasticated front inside, however a prototype I made didn’t work out, so I decided to just follow the instructions instead. Just in case you’re wondering, I got 17/20 marks which wasn’t enough to even get third prize so high is the competition in the Women’s Institute! It’s going to be a handmade evening tonight as I made my dress, velvet cape and my bag, albeit over the last 25 years, hopefully tomorrow there will be some photos to share. 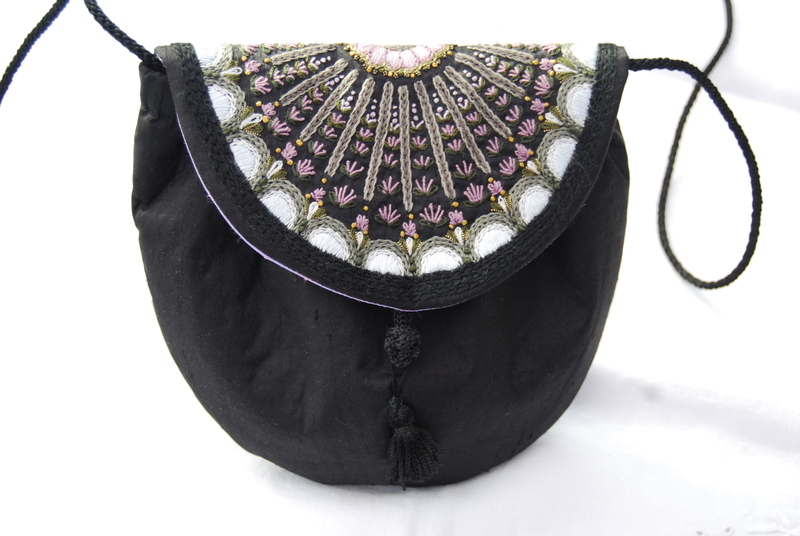 This entry was posted in Crafts, Serendipity, Sewing and tagged embroidery, evening bag, silk. Bookmark the permalink. Wow, Wow, Wow! That is incredible talent. It is absolutely beautiful! And top it off you made the dress and cape–amazing. I want to Thank You for stopping by and linking up with “Anything Goes Monday”. I so have enjoyed being a guest host and meeting so many new quilty friends. I just started following you via Email and look forward to more of your creations. Thank you so much, I’m still new to blogging so I’m just starting to join in link parties, great fun!